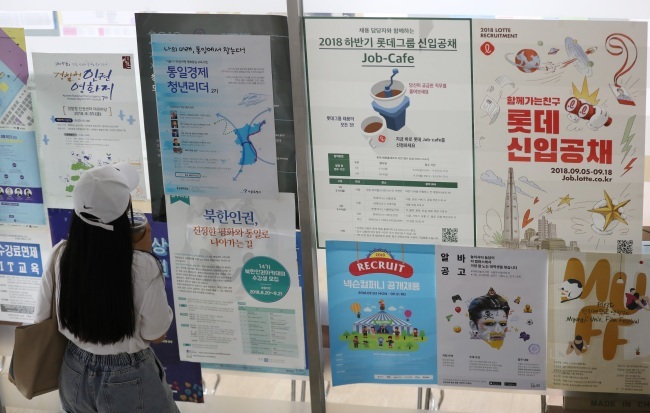 South Korea’s job creation has been slower than last year despite the government’s push to tackle worsening employment conditions, date showed Saturday. According to the January-August jobs data, the number of employed people stood at a monthly average of 26.74 million, up about 107,000 from the same period a year earlier. The growth is down from the 335,000 on-year gain tallied during the same period of 2017, the data showed. Experts say that the government’s aim of adding 180,000 jobs this year will be hard to achieve given the current job growth pace. In June, the government cut its annual job creation target to 180,000 this year from 320,000 in consideration of worse-than-expected employment conditions. Latest jobs data showed that the country’s unemployment rate stood at 4 percent in August, up 0.4 percentage point from the same month last year.